Meet our two newest kitchen team members, Christa and Sam, our wonderful Kitchen Coordinators! 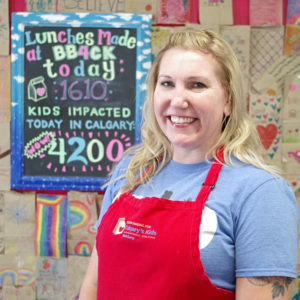 “I started as a volunteer in March 2018 and fell in love with Brown Bagging for Calgary’s Kids. I was looking for a volunteer opportunity and came across a friend on social media that brought his company into the BB4CK kitchen. I thought to myself WOW, that looks like a great spot to volunteer, and sent an email to BB4CK that same day! Christa’s favorite lunch as a child – Back when avocados were not popular I loved an avocado and tomato sandwich with mayo, salt and pepper. I also enjoyed sliced apple with cheese. These still remain my FAVES! “Prior to the amazing opportunity of working for Brown Bagging for Calgary’s Kids, I volunteered at BB4CK for a year and a half. I first found out about BB4CK when I met BB4CK’s Executive Director, Tanya, during a group interview for Dote Magazine’s “Girls Who Give” SS17 Editorial. 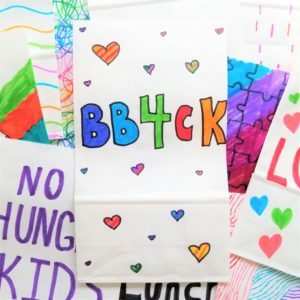 After learning more about the vision and mission of BB4CK, I knew in my heart that I wanted to help and be a part of BB4CK in some way. It was absolutely heart breaking for me to know that there were so many children in our city that went hungry each day, but it had brought me such joy knowing that in doing my little part in volunteering on the days that I could at BB4CK, I too was making such an impact and difference in fulfilling the need to feed hungry kids in Calgary. My favourite part about BB4CK is the feeling of family and purpose. I am always inspired and motivated by my co-workers and volunteers every day. Does taking meaningful action inspire you? Are you looking for an opportunity to make an impact in the daily life of a child? Are you passionate about creating social change, engaging with and having an impact on your community? Brown Bagging for Calgary’s Kids (BB4CK) has an opportunity for a dynamic individual to join our dedicated team! 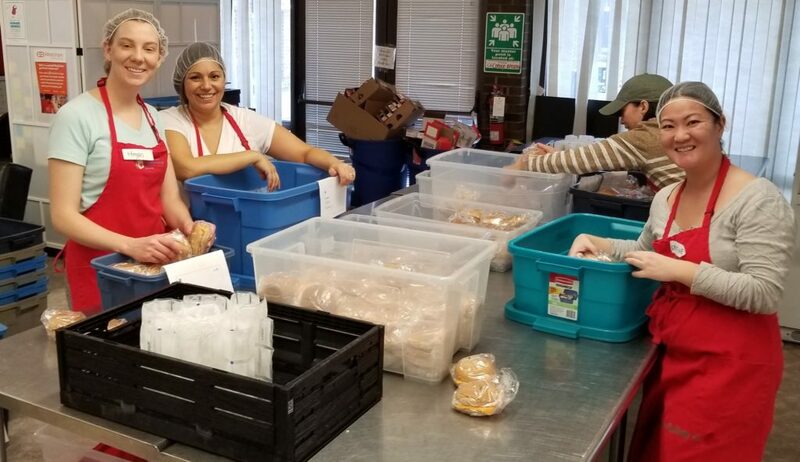 Working cohesively with the Director of Kitchen Engagement and our awesome Kitchen team, the Distribution Coordinator is an integral part of a committed, hardworking and fun team! This position is a 3 month contract with the possibility of extension. This individual will work 16 hours per week, Monday-Thursday from approximately 8:00am-12:00pm. The Distribution Coordinator ensures the organization of food leaving the kitchen, delivery drivers and delivery routes. BB4CK offers competitive compensation. Salary/wage will be commensurate with level of experience. If you are looking for a purpose driven and compelling place to work, please email your cover letter and resume to jan@bb4ck.org by March 15, 2019. Brown Bagging for Calgary’s Kids is seeking the right person to join our Board of Directors. We believe strongly in empowering communities to take meaningful action to feed and care for kids. We are looking for someone who is passionate, forward thinking, and prepared to re-imagine how we create communities that make sure all kids are fed. Experience in the areas of fund development and/or risk management would be an asset. However, all members of the board are expected to support, participate, and access their networks in support of BB4CK. Please read the full role description here. Our donors make incredible things happen. 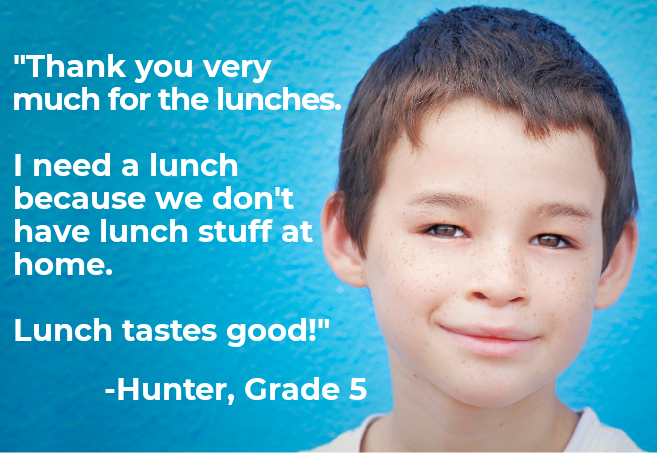 The lunches they fund each day for students across our city give children the energy and nutrition they need to have a great day at school. The carrots and celery purchased in part by Daniel helped Caitlin focus on equations in math class, not her growling stomach. The sandwiches made possible by Chris gave Hannah the energy to play badminton with her friends in gym. The oranges funded by Melissa helped Jordan make a new discovery about coniferous trees during science class. The muffins provided in part by Naomi helped Sebastian ace his recorder rendition of “Hot Cross Buns” during music. Through their gifts, Daniel, Melissa, Chris, and Naomi made a huge impact in the lives of kids in our city. They are some of our “Hunger Heroes” – making monthly donations to support children like Caitlin, Jordan, Hannah, and Sebastian in being at their best. We are calling on Hunger Heroes across the city to help feed and care for the children in their communities. 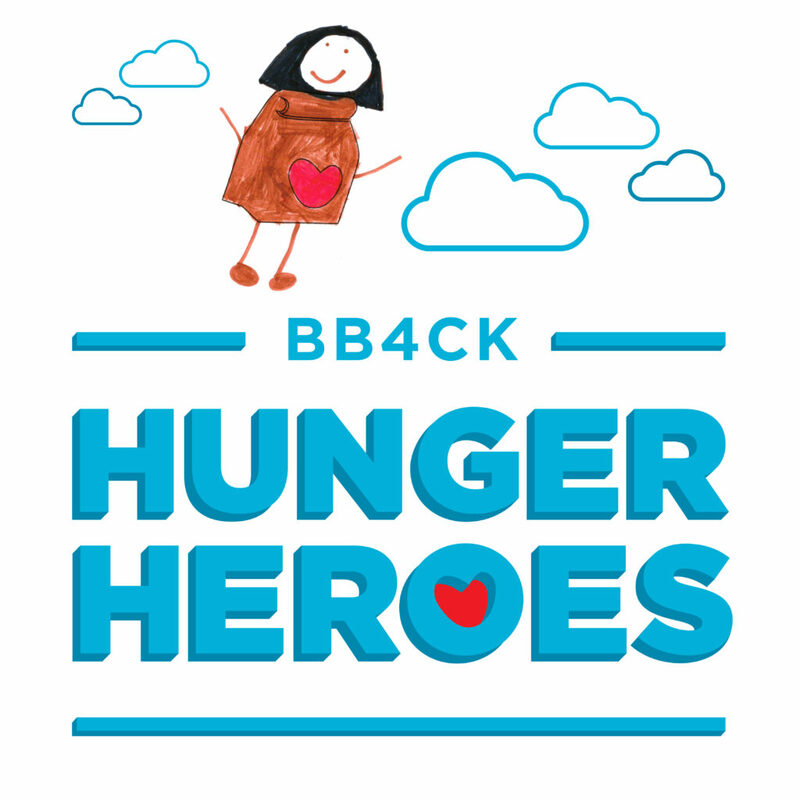 Accept the mission to strike out hunger and become a real life Hunger Hero by visiting bb4ck.org/hunger-heroes to make a monthly gift. You have the power! What does a Hunger Hero looks like to you? Create your own Hunger Hero by printing out this colouring sheet. Once designed, share your Hero with us by using #HungerHeroes on social media.